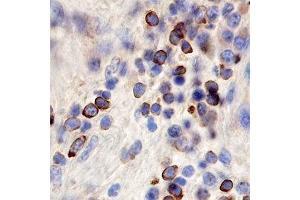 Frizzled-6 in Human Kidney Cancer Tissue. Frizzled-6 was detected in immersion fixed paraffin-embedded sections of human kidney cancer tissue using Goat Anti-Human Frizzled-6 Antigen Affinity-purified Polyclonal Antibody. Specific staining was localized to cell membranes. Specificity Detects human Frizzled-6 in direct ELISAs and Western blots. In Western blots, approximately 10 % cross-reactivity with recombinant mouse (rm) Frizzled-6 is observed, and less than 5 % cross-reactivity with rmFrizzled-1, rmFrizzled-2, rmFrizzled-3, rmFrizzled-4, recombinant human (rh) Frizzled-5, rmFrizzled-7, rmFrizzled-8, and rhFrizzled-10 is observed. García-Castro, Alvarez-Zavala, Riveros-Magaña, Ortíz-Lazareno, Ratkovich-González, Hernández-Flores, Bravo-Cuellar, Jave-Suarez, Aguilar-Lemarroy: "Restoration of WNT4 inhibits cell growth in leukemia-derived cell lines." in: BMC cancer, Vol. 13, pp. 557, 2013 Method employed by authors: Flow Cytometry (FACS), Flow Cytometry (FACS), Flow Cytometry (FACS) (Sample species: Human).